Over the weekend, a friend of mine ran 100 miles in an ultra race nearby. I have read about these races in various books and through different sites but I have never actually known an runner who did 100 miles! It is just an incredible feat! Here I am talking about running a half marathon in a few weeks and then a marathon a few weeks after and combined, I don’t even come close to this feat! It is just amazing to me and as I get healthier on the running front, my mind begins to wonder, “what if” I ran a 100 mile race? For all those who run these races, cheers to you! So how many people run Ultra races each year? Well, according to a the site DUV, there are about 38k ultra runners who participated in an event this year doing on average 1.59 events each. The most popular of this section of races is the 50km race with 29k runners (dividing by 1.5 and you end up with 22k unique runners). The least popular (and probably hardest) is 6 day race with 44 people having run such. Of the timed races (such as the 6d), the most popular is the 12 hour race followed closely by the 24 hour. 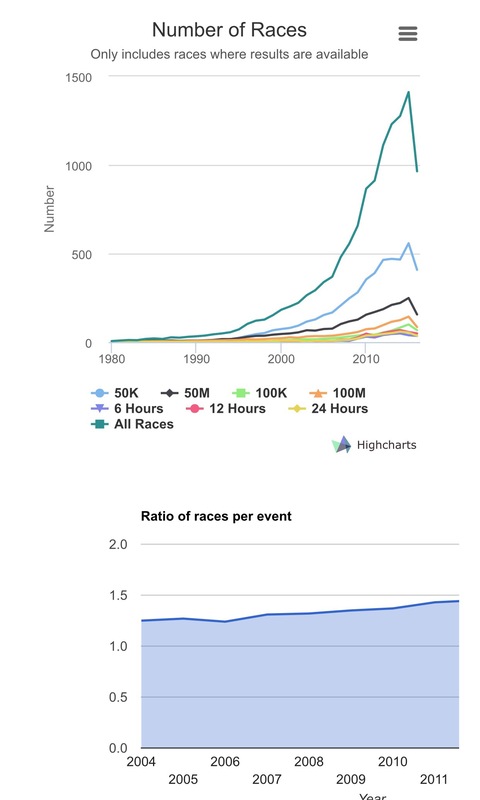 As the chart below from Runners World shows, ultra running has climbed dramatically over the past 15 years and while there is a drop off on the chart, the popularity remains on the rise it appears. For those who wear Hoka One One and love the old Clifton 2s, the Runners Warehouse is having a decent sale on them ($70). I am wearing the 3s now and getting used to them but I am tempted to put another pair of the 2s back in my closet! For those who care, my running injuries continue to unwind and I am feeling better each day! I hope this follows through into my next race coming in two weeks in Newburyport! I want a solid run but if I continue to feel good, I am going for an PR! Lastly, my next Test is Luvo meals. Yes, I tried these before but I have a bunch of new flavors to contest with now! Very excited because I liked the meals the last time I tested some of them. Well, that’s it. Have a good day and thank you for reading! Previous Post UCan use these Bars! Timed races are great for the perspective that you can run as much or as little as you want. Thank you for the thoughts. I think I will take a look at them!